snowdeal.org > ex machina: the eric update - day 1167: when mamma's away, the boys will play. the eric update - day 1167: when mamma's away, the boys will play. mamma is out of town for the entire labor day weekend, so it's just us guys hanging out. 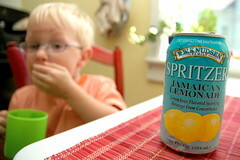 and we're not sitting around slamming cans of jamaican lemonade. nope. not at all. this site chronicles the continuing adventures of my son, odin, who was unexpectedly born on the fourth of july at 25 weeks gestation, weighing 1 pound 7 ounces. he's quite a fighter and you can always send him a postcard to the most current address listed here if you're inspired by his adventures. see the postcard project/google maps mashup to see a map of the postcards. if you're new, you can browse the archives to catch up. and don't forget to watch a few movies that i made while we were in the neonatal intensive care unit. or if you want the abridged version and you can find a copy, you can read about his adventures in the november 2005 issue of parents magazine. look snazzy and support the site at the same time by buying some snowdeal schwag! Eric C. Snowdeal III .